I’ve loved this word since early in college at UVA, where it was often used for that guy we always mentioned as though he were in the next room: Thomas Jefferson. Though his life and legacy have been fairly scrutinized by good scholarship since those days, both for his treatment of enslaved people and some of his impractical ideas about self-governance, no one I have met or whose work I have read doubts that Jefferson had as deeply a philosophical turn of mind as the French philosophes of The Enlightenment. But was he “sagacious”? Is sagacity the same as brilliance? The OED’s first definition, from a French word, floored and enlightened me. Though it’s obsolete, sagacity once related to having an “acute sense of smell.” That idea persisted through the 17th Century, when a more modern sense of “shrewdness” or “sound judgement” came into usage. Sagacity, then, has more to do with practical sensibilities than “book learning.” Meanwhile, shrewdness itself, from a Middle English word, has never had a completely positive sense, morally. 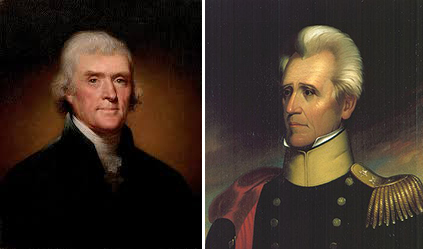 After reading Alan Pell Crawford’s excellent Twilight at Monticello, I’d argue that Jefferson’s sagacity was limited. At the time of the Declaration, he smelled the times correctly. Later, he proved less sagacious in missing the religious changes as Anglican Virginians veered toward more conservative sects. Jefferson remained rather naive about the ways that enslaved peoples might be freed over time, and he underestimated the divisions that emerged in America by the 1820s. One might, looking at the evidence, say that while Andrew Jackson was far less educated than Jefferson, “Old Hickory,” with his many faults, was far more sagacious politically. And that in no way is praise for him or Jefferson. Let the scholarship speak for itself. I will be sagacious enough not to wade any deeper into those waters. If you have an interest in Crawford’s book, I’d start with this audio interview by the Virginia Museum of History and Culture. Image mashup, from Creative Commons sources, by the author.